With warmer weather come the joys of eating al fresco. 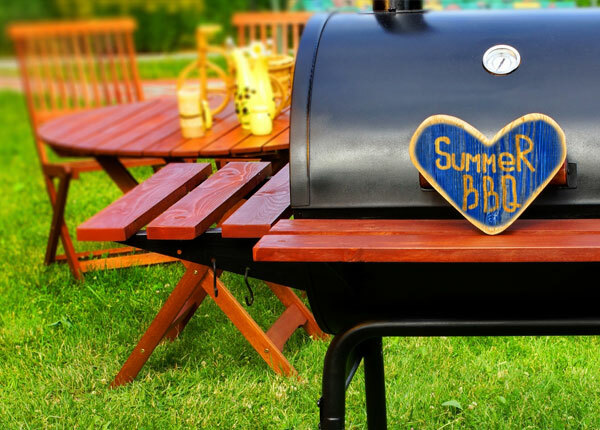 Barbecues, picnics and outdoor eating are common when the temperature rises. Separate raw and cooked foods. Once you place raw poultry, seafood or meat on a plate, don’t reuse that dish or utensils. Use a clean plate and utensils to serve cooked foods. If you must reuse the plate and utensils, rinse them thoroughly in hot, soapy water. Stay clean. Prevent the spread of germs by washing hands with soap and water after using the bathroom and before and after preparing any foods. If a sink isn’t nearby, use bottled water, soap and paper towels. Or, use disposable towelettes. Marinate properly. Food should marinate in the refrigerator, not the counter or outdoors. Refrigerate marinated food until you plan to cook it. And don’t reuse the marinade as a sauce since it has had uncooked food soaking in it, which could make you and others sick. If you want to use the marinade as a sauce, portion it out separately before marinating your poultry, seafood or meat. Cook food properly. Don’t just look at the meat’s color to determine if it’s been cooked enough. A food thermometer can tell you if food has been cooked to the right temperature. According to the U.S. Food and Drug Administration, cook ground beef to 160 F; poultry to 165 F; and steaks, roasts, pork or fish to 145 F.
Keep hot foods hot and cold foods cold. Wrap hot foods or insulate them in a container to ensure they stay at 140 F or higher. Refrigerate cold foods at 40 F or below until you plan to serve them. Otherwise, bacteria can multiply. Once you’ve served the food, put it in the refrigerator or freezer within two hours. If it’s warmer outside than 90 F, don’t leave food out for more than one hour. (Toss it if it has been left out longer.) If you aren’t near a fridge, set it in or on ice with ice packs, frozen gel packs or an insulated cooler. Replenish the ice as it melts and keep this food out of direct sunlight. Ensure that food and drink are apart. The beverage cooler will be open and shut constantly. So put drinks in one cooler and food in another so the food one can kept closed until you plan to cook. Raw meat, poultry and seafood should be securely wrapped and placed at the bottom of the cooler. That way if something leaks, it won’t get on fruits or vegetables that will be eaten raw.